My name is Michael Robbert. I am a 35 year old male working as a computer Systems Administrator in Golden, CO. I am also an avid runner and triathlete living with cancer. In October 2007, I was training for the Denver marathon. Training was going great, and I felt like I was on track for my best race yet (and I’ve run quite a few). About 2 weeks before the race I got sick. I passed it off as food poisoning until I nearly fainted in our bathroom. My wife took me into the emergency room where they did emergency surgery to remove an ulcerated tumor from my stomach. Later I found out the tumor was a malignant GIST (Gastro Intestinal Stromal Tumor) which had already metastasized to multiple sites in my abdomen. GIST is a rare type of sarcoma known to not respond well to standard chemotherapy nor radiation. Luckily, in recent years research has made it fairly well understood, and there are now targeted chemotherapy drugs that work very well in most cases. I immediately started on Gleevec, the standard first line treatment. Unfortunately, my tumors didn’t respond well and continued to grow. A dose increase helped at first, but then started to show signs of growth after a few months. Around that time I decided to get a second opinion from the experts at M.D. Anderson Cancer Center (MDACC). The team of doctors there prescribed a second line drug called Sutent. The Sutent seemed to be working fairly well with check-ups every 3 months in Houston, TX. In the fall of 2009, the scans showed that growth had continued again, and we needed to try something new. The doctors decided the most promising option for me was to start a clinical trial for a newer drug called Dasatinib. The protocol for this trial required me to get checkups every 28 days at MDACC in Houston. The travel to Houston was already becoming a burden, but we decided we needed to go ahead with the best option for my health. Knowing my travel was going to get even more frequent and expensive, I spent several months investigating and trying out different options for travel assistance. They weren’t fitting my needs for various reasons, and the now frequent trips were starting to really take their toll on our finances. Finally I found Lazarex and applied for their assistance. The day I got my acceptance letter saying they would be willing to pay for my airfare and lodging was a huge relief for me and my wife. I have been traveling to Houston every month since, and this has only been possible with the financial assistance I’ve been receiving from Lazarex. My doctors have told me I will have cancer the rest of my life, and I should expect to be on one drug or another. Dasatinib is working well for me now, but the doctors expect I’ll develop resistance to it eventually. When I do, I’m hopeful I’ll find a new trial which may require just as much travel as I’m doing now. As long as Lazarex has the funds to continue helping, my focus can be spent on my fitness rather than my finances. After all, the doctors state my fitness is what helps me tolerate the treatments better than most cancer patients. In 2012 Michael became a candidate for surgery after the cancer in his body responded to the clinical trial medicine he was receiving. As a result of the surgery he was declared cancer free. As of this update on April 2017 he remains cancer free. Since his surgery Michael set multiple personal records while racing. He’s participated in the Boulder 10k, 14 consecutive times where he recently set a new personal record Memorial Day, 2015. He also set a personal record at the Star Wars 10k and half-marathons. 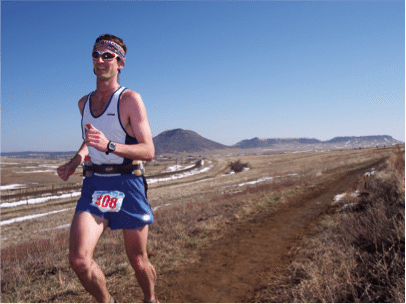 Robbert ran his first Grand Mesa Ultra Marathon which spans 100 miles (!) in Colorado and countless races since then.